Welcome to a new weekly series I'm going to start! I use so many products during the month that they often only appear in an empties post when they deserve so much more, either because they were that good or that bad:) So, I am going to start a new series called Trash or Treasure. Each week I will post about one product that I have used during the week and whether I liked it or not. The post will often be about a sample I have tried out during the week in an effort to continue to use up my samples instead of letting them collect like I did this year. However, it could also be a full size product that I have been using as well. Shoutout to my #instabesties for helping decide on a name for the series! 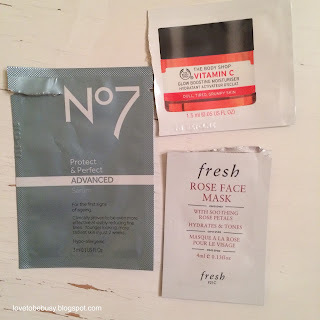 To start I'm going to talk about 3 product samples I have been using during #samplesept (see post about that here). The Body Shop Vitamin C Glow Boosting Moisturizer - Verdict: Treasure! This moisturizer has the vitamin C that I like to use in my products in the morning. I have been using the Ole Henriksen Truth Serum every morning that has the citrus burst to it as well. I like the gel like feeling of this moisturizer. It sunk it quickly and worked well under my makeup. It was a bit sticky when applying but did not make my skin feel sticky, just noticed it a bit on my hands. My only gripe is that finding an actual store to purchase The Body Shop products is hard. My Ulta carries some of them (not sure about this product specifically because I haven't looked) but otherwise I have to order online (which is fine if you can catch a free shipping with no minimum). The full size of this product is $30.00. No7 Protect and Perfect Advanced Serum - Verdict: Treasure! I like the feeling of this serum. It is closer to a lotion than an oil so I like that it doesn't make my skin feel greasy or oily like some serums do. I mostly wore this at night but I did try it in the morning to see how it wore under my makeup and I liked it for that purpose as well. I know my Target sells some of these products as does my Ulta. Prices run about $25 which is good for an anti-aging serum. Fresh Rose Face Mask - Verdict: Treasure! Face masks can often irritate my sensitive skin so I never know how a sample will work for me. This mask made my skin feel soft and hydrated without irritating it. The rose scent was very subtle and not at all overpowering. The drawback for me is the price. It is $62 at Nordstrom and I feel like there are other masks that work well for a cheaper price tag. But if I had a gift card or Sephora coupons, I would consider picking it up. Since I am using up (or trying to use up) all my samples this month, I purposely picked some of the best ones I tried for this post. That may not always be the case as I use what I have from current orders. *All products were purchased with my own money. All opinions are my own. I was not compensated in any way for this post.